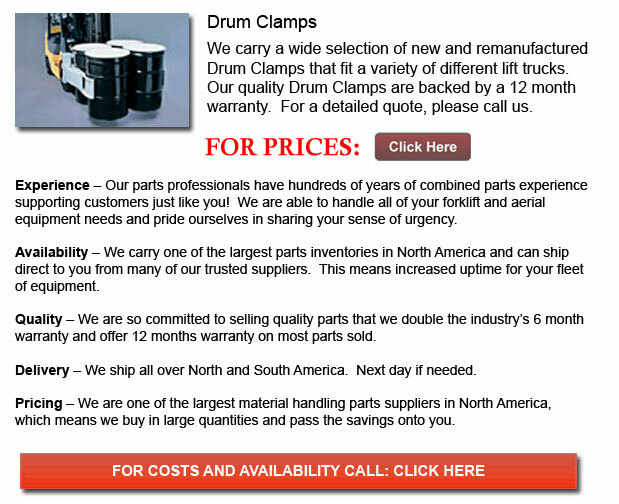 Drum Clamp - Forklifts are actually utilized to move, lift and store things placed on pallets. For facilities which use drums, they normally require an attachment to handle storing, lifting and moving them. There are some various attachments that a business could utilize for all of your drum lifting, moving, and storing needs. These attachments are specifically designed to handle drum containers - thus there is no chance of damage to the item or drum container whenever they are stored, moved or lifted. The drum positioner is accessible in three or four tine models. They are operational for the unloading and loading of drums off vehicles, drum stands and racks. This particular accessory is completely mechanical, therefore allowing the person operating it to be able to operate all from the comfort of the lift truck seat. Able to move steel, large and extra large plastic drums, its capacity is 210 liters. This particular accessory is used for drum pyramid stacking. The drum grab can be mounted to the forks, with a designed objective of handling metal drums that have rolling hoops. Though the initial reason for the design was to handle steel drums with rolling hoops, the drum grab can help accommodate plastic drums also. Drum capacity maximum is 210 liters for steel drums with rolling hoops and 220 liters for plastic drums. The drum rotator is actually a lift truck attachment which mounts on to the blades themselves. The objective of the drum rotator is to be able to lift the drum and turn it upside down. The drum fits in to the rotator using a steel clamp that fits over the center of the drum. The rotation is done by either a continuous loop chain or a crank handle. The crank handle is used for operations which happen beneath shoulder level. For operations which should take place over shoulder level, the continuous loop chain will be utilized. Drum tines are straightforward fork mounted accessory that could be used for stacking and unstacking 210-liter metal drums. Stacking requires nothing fancy, merely easy horizontal positioning of the drums. The carriage-mounted accessories decrease the load center of the drums. Drum tongs are accessible both semi-automatic and automatic models that could be used in the open topped and tight head steel drum kinds. The drum tongs can even be connected several various ways to the forklift. One method is to connect them under a fork-mounted hook. Another way is to connect them to a fork-mounted jib or a carriage mounted jib. Either the automatic and semi-automatic have a drum capacity of 210 liters. With the automatic, there is no need for the operator to ever leave the seat of the forklift. Whenever drums require storage space with limited spacing obtainable, the Rim Grip Drum Handler is the ideal alternative in drum forklift accessories. This particular attachment would work for both the two hundred ten liter drums as well as one hundred twenty liter drums. The Rim Grip Handler works by utilizing metal jaws so as to grab the edge of the drum. It picks the drum up and puts it down without requiring any room between all of the drums. The typical model utilized in the trade is a zinc-plated handler, even though, this accessory is obtainable in stainless steel for the food and drink market.